Scopri le meraviglie storiche e il fascino regale di Windsor in un viaggio turistico indipendente da Londra. Assapora la flessibilità di questo tour personalizzabile, il cui itinerario può essere personalizzato in base ai tuoi interessi e visita solo le attrazioni che desideri vedere con un autista privato. Forse esplorare le opulente camere del castello di Windsor o vedere i prestigiosi edifici scolastici di Eton in questa escursione arricchente. Tutti i biglietti d'ingresso e i rinfreschi devono essere acquistati a proprie spese. Parti dal tuo hotel londinese in posizione centrale in un veicolo privato e fai la conoscenza del tuo autista personale sulla strada panoramica per Windsor. Personalizza il tuo itinerario durante una discussione con il tuo autista e poi parti alla scoperta dei luoghi che desideri vedere. Forse, visita l'attrazione più importante della città, il Castello di Windsor, una residenza ufficiale di Sua Maestà la Regina cullata da verdi colline ondulate. Avventurati nelle opulente camere del castello e guarda le decadenti Camere di Stato e la Cappella di San Giorgio. Amble intorno ai 13 acri motivi e poi tornare al tuo veicolo per vedere una cerimonia speciale. Dirigetevi verso il centro della città per vedere la cerimonia quotidiana del Cambio della Guardia, una performance colorata in cui i soldati vistosamente vestiti marciano al ritmo dei tamburi militari. Guarda lo spettacolo tradizionale in soggezione e poi dirigiti al Windsor Great Park per ammirare le file simmetriche di alberi e le aiuole luminose su una piacevole passeggiata della Long Walk. Optare per viaggiare a Eton, una città storica casa al prestigioso Eton College, e sfogliare le boutique artigianali della zona. In alternativa, scegli di visitare la vicina città di Runnymede per visitare il sito sul quale re Giovanni sigillò la Magna Carta nel 1215. Rilassati durante il viaggio di ritorno a Londra e goditi la comodità del drop-off in hotel. This was an independent trip and was driven by a private driver. We were on our own and had about 2 hours to explore and see the palace. There was really no time for anything more than that. While we appreciated the comfort of riding in a car, we were disappointed with the driver's contribution to this trip. He had very little to say and mostly complained that the company he worked for should have told us to be ready for pick up at 9 am instead of 10 am. It was obviously and inconvenience for him and he went on and on about his unhappiness with this. Made us feel nervous as though we had done something wrong when in fact it was his company that made this determination - not ours. 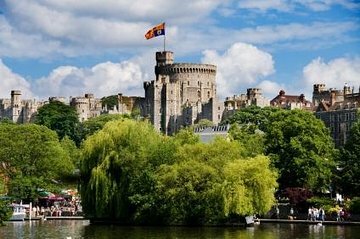 Do not expect to have a leisurely stroll around Windsor - you will need to be ready to go and reviewing the castle grounds and what you want to see before hand will be helpful. Also, if you can preorder your entry tickets, it will be helpful and shave off precious time. The driver was prompt, polite and very patiently explained and answered all our queries. This tour, unfortunately, was not at all as it was described on the website. It was merely an over-priced ride to Windsor Castle. For starters, the website states that the tour begins at 9am. After waiting in the cold for quite a while, we called the tour company and were told it actually began at 10am. The driver was kind enough to arrive as soon as possible. When he arrived, we had no option to see any other sites in or around Windsor or Eton and, when we asked the driver about tips, he didn't have anything to offer. As some of the previous reviewers noted, their drivers provided information about what they were seeing along the way. Our driver gave no information at all along the drive, or any information about the Castle. Very disappointing. Driver arrived late,only because he claims his company does not start until 10am. Our trip was to start at 9am according to our Viator information. Driver then said his Company has inform you many times on this issue. I believe this miscommunication lead to less time at the Windsor,because of traffic. When we bought this package over the phone we were told the tickets to the castle were included. The driver had no clue about that so we ended up purchasing tickets after he dropped us off. The driver was excellent and we thoroughly enjoyed our 4 hours we spent st the castle. Our driver/guide was super. He adjusted our tour to meet our special needs. Could not been any better. Great getting to Windsor with a very knowledgable driver. Our driver was on time and friendly. It would have been better to have a guided tour of the castle along with the tour. We had a blast with this tour. Ahmed was terrific. Very knowledgeable and catered to our needs with a custom visit. Would definitely do this again. Thanks!